These spaces are for your exclusive use only. They are designated on the ground level of the garage. With the rental of this space, you will be issued a 24-hour access card which requires a $25.00 processing fee. These spaces are throughout the various levels of the garage. You may park in any space other than a reserved or handicapped space. With the rental of this space, you will be issued a 24-hour access card which requires a $25.00 processing fee. Nexus Parking Systems’ monthly customer rules and regulations are listed below. If further assistance or interpretation is required, please go to the website of www.nexusparkingsystems.com and click on the Customer Service Support button which will submit an email to our customer service representative. Monthly payments are due by the 25th of each month for the upcoming monthly payment. If payment is not received by the due date, the system will automatically de-activate (turn off) the access card. If an access card is turned off due to non- payment, the customer will have to surrender the access card to a customer service representative until payment is received. Monthly accounts are subject to a $35.00 reactivation fee. In the event that a customer has not satisfied the monthly payment, customer will then be considered a daily customer and will need to take a ticket upon entering the parking facility until the monthly payment is paid and processed. Daily parking fees are not refundable. Cash is not accepted for monthly payments! Accepted forms of payments are; check, money order, cashier’s check, direct debit Credit Card, and ACH direct debit from a checking or savings account. In addition to the listed forms of payment, Nexus Parking Systems participates in commuter pre-tax saver programs offered by WageWorks, CommuterCheck and TransitChek. A fee of $35.00 will be assessed for any late or returned payment. If a customer generates history of late or returned payments, Nexus Parking Systems reserves the right to require payments to be made ONLY by ACH direct debit or credit card. Monthly parkers canceling their account are required to submit an Account Change & Cancellation Form 15 days prior to the payment due date. The access card and hang-tag (if applicable) must be returned to the customer service office on the last day of use during the current paid month. Nexus Parking Systems does not refund payments once the payment has been processed. The access card/hang-tag can either be mailed or returned to the customer service office located on the ground floor of the parking facility. Return receipts are available at the customer service office. Monthly invoices and receipts are sent automatically via email. Nexus Parking Systems does not mail paper invoices and receipts in effort to Go Green. If a customer does not receive a monthly invoice for whatever reason, the customer is responsible to make payment by the due date. If a customer did not receive a monthly invoice or receipt via email, please go to the website www.nexusparkingsystems.com and click on the Customer Service Support button to submit a request to our customer service representative. Access cards are not transferable! If any card is found to have been transferred to an unauthorized parker, the access card will be confiscated and the account will be permanently closed. If any card is lost, stolen, or damaged, management must be notified and there will be a replacement fee of $25.00. This fee will also be invoiced to the customer if an access card is not returned after an account is closed. 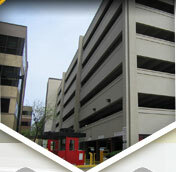 Only one vehicle per access card is permitted in the Parking Garage at any given time! DO NOT USE CARD for any other vehicle but yours. If an access card is used incorrectly, the system automatically deactivates the access card. Depending on type of unauthorized use, a fee may be charged or the card may be confiscated and account closed. Fee amount depends on type of unauthorized use. See customer service office for any assistance. If a customer does not have their access card at entrance or exit gates, they are required to take a daily parking ticket and pay the required fee before exiting. This fee is non-refundable and the fee amount depends on the length of stay..
Access Cards are leased and are the property of the parking garage. Upon request, customer must surrender the leased access card to parking management or any authorized employee of the parking management company. All vehicles must follow the specified traffic flow pattern and signs within the garage. Posted speed limit is 5mph/8kph. First time offenders will be given a warning and the violation will be noted on their account. Further infractions will result in a violation fine (see garage for violation fine rates); or termination of your monthly parking privileges for a serious offense. Do not park in reserved spaces, fire lanes or hash marked/gridded lanes. Park the vehicle parallel to and between the yellow, white or blue lines. If another parker parks over the line, do not park next to that vehicle if it causes you to park over the line. You will be given a violation. Violators will be cited and will be towed at owner’s expense, or wheel locked and subject to the fines listed below. The violation fees can be paid at the garage and soon by visiting www.nexusparkingsystems.com. Verbal or physical abuse against any parking employee will not be tolerated and is subject to account suspension or termination. Vehicle storage or extended monthly parking past 21 days is not permitted in our parking facilities for both security reasons and garage cleanliness. Garage use is for daily parkers, commuters or temporary visitors only. Remove all valuables from your vehicle. Do not leave items such as cellular phones, radar detectors, GPS devices and electronic music devices visible in your vehicle, as these items could only invite problems. Lock your car! Take your keys! This is a self-park facility. This contract licenses the holder to park one vehicle in the parking facility at the ticket or permit holder’s risk. Parking charge is for use of parking space only. The management specifically disclaims any liability or responsibility for damage or loss due to fire, theft, collision, vandalism or otherwise to the vehicle and its contents, however caused. Nexus Parking Systems thanks you for adhering to our rules and regulations, and hopes your parking experience is enjoyable!